Cook and owner Silvio Medoro opened Silvio’s on October 26, 2005, but his story starts in Italy. He grew up on the family farm, which supplied much of the family’s food. His “food experience” started with eating what was organic, and fresh, and of course, all made from traditional Italian recipes. Italy, of course, is where the first, and best, pizza sauce originated. His recipes come from the published work of The Association of Italian Bakers with tweaking and substitutions, obviously, for common food allergens. The challenge when working with gluten allergies is getting a GF dough to taste good as well as rise acceptably. Silvio uses xanthan gum, as well as yeast, along with a blending of flours of sorghum, chickpea, fava beans, potato starch, and rice flour to accomplish these goals. He makes a pizza dough vegan by leaving out eggs, and substituting tapioca. In the quiet of the morning, before the hubbub of the day begins, Silvio personally makes the pizza dough. He begins by thoroughly cleaning anything and everything to wipe all trace of allergens from the kitchen. The dough never even touches the oven or pie pans because he lines the pans with parchment paper. Then the cooked dough goes straight to the plate. While pizza is a favorite item on the menu, there’s more than pizza at Silvio’s that’s gluten free. 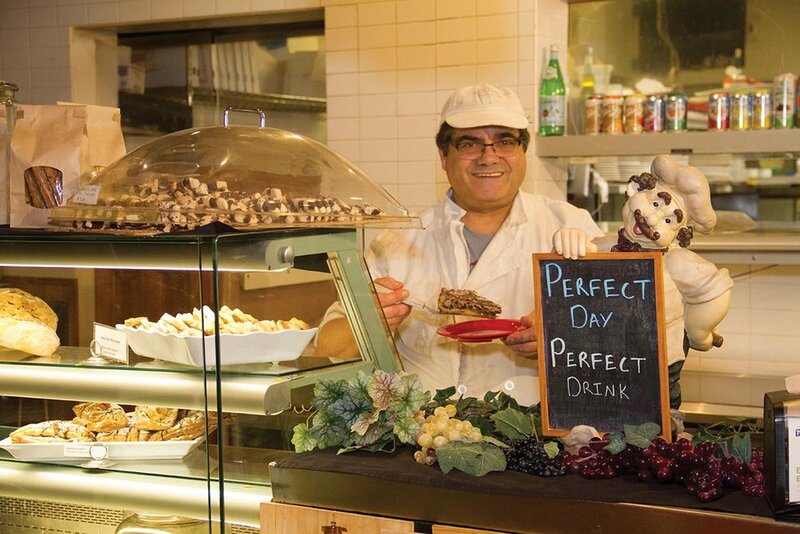 His sandwiches can be made gluten free, and the soups are gluten free, and even some of the best desserts: cheesecake, cookies, and tiramisu have GF options. Call ahead if you are looking for something specific, as the menu changes daily. From the beginning Silvio has tried to make his food with compassion for the many who have allergies. His interest is in offering a product that won’t only keep you coming back, but that you know is good for you. A family who planned to visit Ann Arbor a while ago contacted Silvio. They had heard of the restaurant and wanted to give it a try, but needed to make sure ahead of time that eating there wouldn’t be a problem for a family member with allergies. When Silvio read his ingredients list over the phone it turned out that even his vegan and gluten free pizzas contained allergens. When Silvio learned that sorghum flour was the problem he rose to the occasion. Consistent with his character, he volunteered to make a special batch of pizza dough without the sorghum. The whole family and guests were delighted to celebrate their visit eating together with no worries or those with food allergies. This is an owner who thrives on compassionate personalized service. He has created his restaurant as an extension of his values: embracing dietary restrictions as an opportunity for a wider sharing of his joy of Italian food. You can visit this innovative pizzeria (which uses herbs grown on-site) at 715 N. University Ave, Ann Arbor, MI 48104. Reserve a table by calling ahead at (734) 214-6666. Dawn Swartz has been happily gluten-free for almost two years. Contact her at: fddlr2003@yahoo.com.